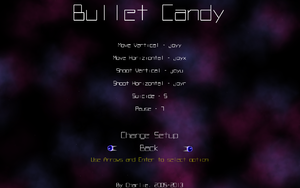 Bullet Candy Perfect. 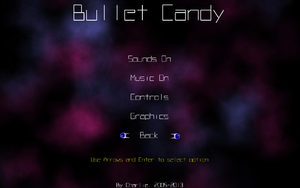 Demo also available. 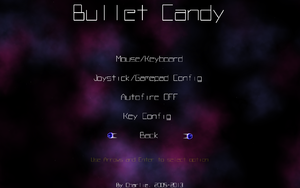 In-game gamepad settings (for Bullet Candy Perfect). ↑ 1.0 1.1 File/folder structure within this directory reflects the path(s) listed for Windows and/or Steam game data (use Wine regedit to access Windows registry paths). Games with Steam Cloud support may store data in ~/.steam/steam/userdata/<user-id>/6600/ in addition to or instead of this directory. 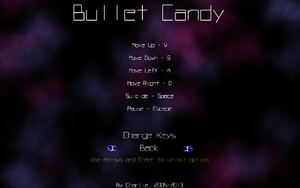 The app ID (6600) may differ in some cases. Treat backslashes as forward slashes. 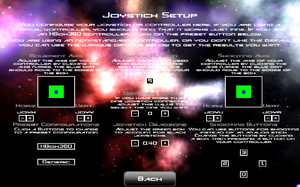 See the glossary page for details. 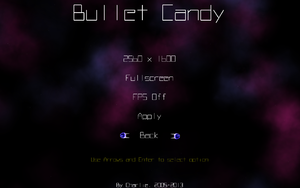 ↑ Linux PR: Bullet Candy Perfect Game released For Linux - For $1!